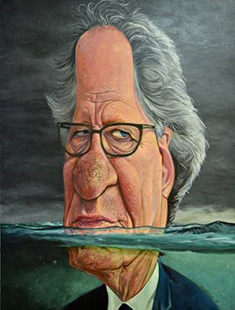 A portrait of legendary Australian actor, Geoffrey Rush, by Melbourne artist and caricaturist Simon Schneider, has taken out this year’s Bald Archy Prize, beating off a cavalcade of notorious politicians and sportsmen. The winner – which carries a prize purse of $10,000 – was announced yesterday at the Sofitel Sydney Darling Harbour, where the 43 finalists will now be on public exhibition until 28 April 2019. Schneider’s work was one of two featuring the great Australian thespian, but infamous cricketers and politicians were without doubt the most favoured subjects for the canvases (though in cricketer Cameron Bancroft’s case, one of the entries was suitably painted on sandpaper). Simon Schneider, who is a well-known artist, illustrator and caricaturist, and a finalist in the Doug Moran Portrait Award, explained why he couldn’t resist the opportunity of showcasing Geoffrey in his entry. “I chose Geoffrey Rush because he has a face full of character and is a caricaturist’s dream,” he said. “He is also one of Australia’s most accomplished actors. Politicians did get recognised in this year’s awards, with Brisbane artist Marty Steel’s hat-trick of acerbic depictions of political figures – Tony Abbott, Christopher Pyne and Bill Shorten – standing out in an avalanche of colourful political caricatures. The Bald Archy Prize has been running since 1994, when convenor Peter Batey decided there was a need for “the larrikin’s answer to the slightly more serious Archibald Prize. We like to showcase the who’s who of Australia, but in a more comedic and satirical manner,” said Mr Batey. This year 53 entries were received, and 43 made the cut to be hung in the exhibition. Amongst the entries this year, the Federal Liberal Party’s backroom brawling features several times, including a version of The Last Supper with Malcolm Turnbull as Jesus before his betrayal and another titled Et tu, Scottie – referencing Shakespeare’s immortal line in Julius Caesar. Soon to depart MP, Christopher Pyne, is featured wielding a baseball bat, Barnaby Joyce is constrained in a straight jacket, and PM heir apparent, Bill Shorten, makes his Bald Archy debut in a work that has him hitchhiking to “nowhere in particular”. Last year’s Bald Archy awards featured a painting of Australian cricket captain, Steve Smith, but the work was ‘scratched’ when word leaked out about the ball-scratching drama, and not surprisingly that lower-than-low incident is reflected in a number of entries this year – most appropriately in Phil Meatchem’s Ball Tampering – which features a portrait of Cameron Bancroft, painted on sandpaper. Celebrities from the entertainment world, comedian Dave Hughes and actors Margot Robbie and Samuel Johnson also make an appearance. 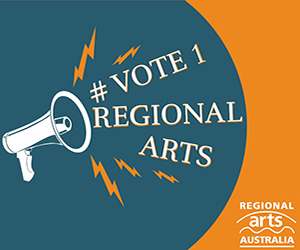 Following the Sydney exhibition, the Bald Archy Prize will travel to the Blue Mountains, Newcastle and Melbourne. 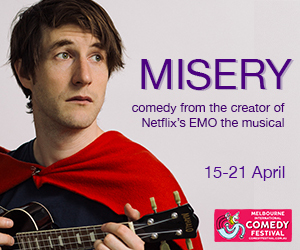 For more information, visit: www.baldarchy.com.au for details.